A few hours in one of the fancy Bangkok airport lounges was a much-needed oasis within a long travel day from Bangkok to Muscat. 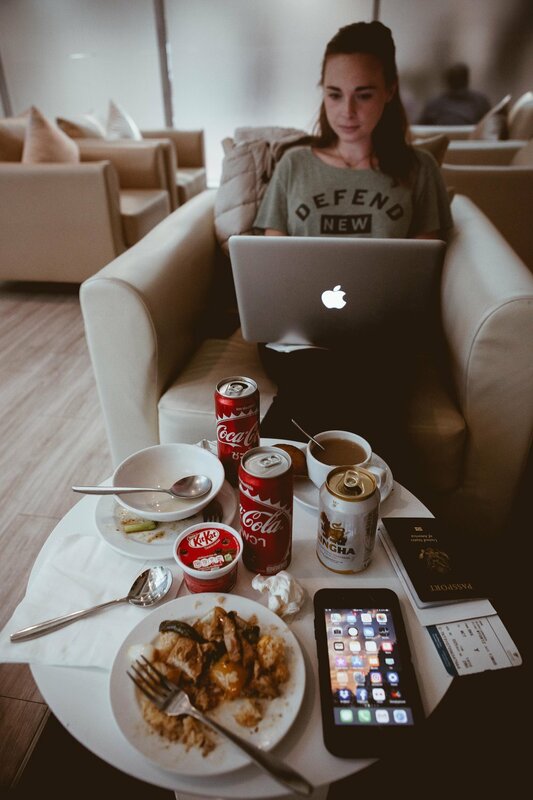 Our Chase Sapphire Reserve card grants us access to these free food, drink and wifi bonanzas in airports all over the world. It's safe to say that the little piece of plastic is a major reason why this trip was possible (points!). We arrived at our Muscat AirBnB accommodation in the charming, beach-adjacent neighborhood of Shatti al Qurum during the flattering golden light of the early evening. The visual appeal of our soon to be home-away-from-home in our hosts' flora packed courtyard was not lost on our drowsy eyes.